Yes, the numbers are correct (within an error margin – probably due to different sources and time of capture). According to the 2018 House election results (I used this handy Washington Post page), adding up numbers for NC, will give you the total of 1,748,173 votes for Democrats and 1,643,790 for Republicans – very close to the claim. Ten of the seats went to Republicans and three to Democrats (Districts 1, 4, and 12), with most Republican wins being quite narrow and Democrats wins overwhelming. Note: One caveat is that the Republican representative for District 3 ran uncontested. That is, it would be more appropriate to say that the result is 9 vs 3, as the total numbers don't include the voters in 3rd district. This is a community wiki supplement to the other answer, which makes the columns easier to read and shows vote difference for each district. 3rd party or other votes are not included. * = uncontested, no votes are listed, same as Washington Post source. Raleigh is in district 4. Charlotte is in district 12. This graphic from the question leaves off the results from district 3. District 3 cast 186,353 votes for the Republican candidate and none for a Democrat (the Republican was unopposed). That flips the total to 1,830,219 Republican votes to 1,748,018 Democratic votes (a margin of 82,201). That's 50.5% to 48.2%. Presumably the other 1.3% went to third party candidates. Remember that the original claim was that Republicans won ten of thirteen races with fewer votes. 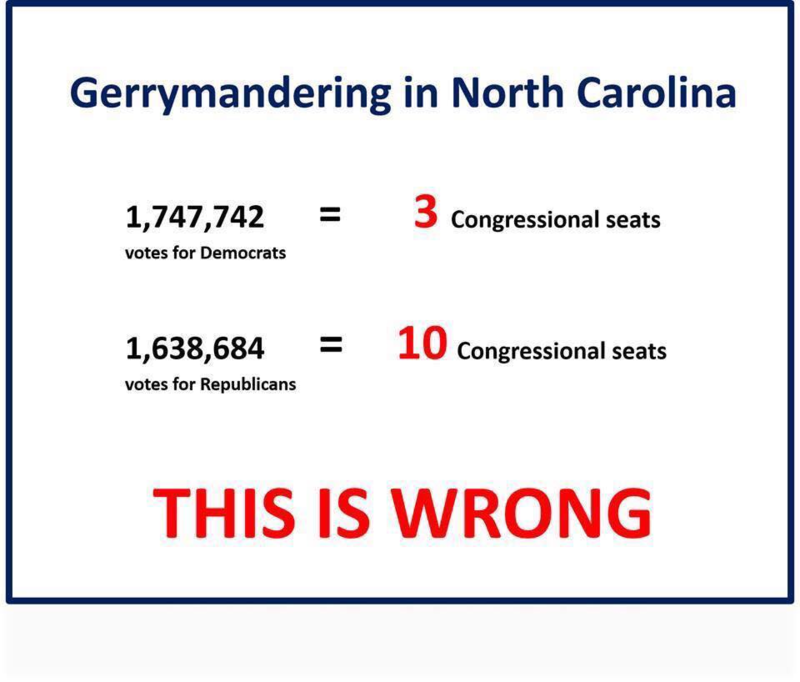 That's demonstrably untrue, as the graphic only includes the votes from twelve of the districts. If it were leaving off the uncontested races, it should only have been nine of twelve contested races. If the claim is instead adjusted so that it only compares the seat proportion to the vote proportion, there are several other states where it's the Democrats who won a higher seat share than their vote share. E.g. three out of four in Iowa with only 50.38% of the vote; five of five in Connecticut with at most 64.4% of the vote; nine of nine in Massachusetts; or California, where Republicans won more than a third of the vote but no more than half as many seats (two still undecided). It also may be worth noting that in North Carolina in 2016 and 2014, the Republicans won by about 300,000 rather than less than 100,000. In 2010, Republicans had over 236,000 votes more than the Democrats but only won six of thirteen seats. Not the answer you're looking for? Browse other questions tagged united-states politics voting gerrymandering .